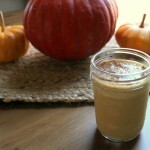 This smoothie is a favorite when you see advertisements for pumpkin-flavored everything! As we head into fall, the fall flavors and colors call to us, but that doesn't mean that you need to spend big bucks for a fancy drink with fake pumpkin 'flavor', you can inexpensively and easily make something even better at home using wholesome ingredients! Use banana to sweeten or if you want something more milkshake like to serve as a dessert or treat, add in the optional sweetener. Optional: 1/4 cup honey for GAPS or maple syrup. Blend until smooth. Top with a sprinkle of nutmeg and enjoy!